It was a chocolate sheet cake cut into the shape of a bunny, covered with fluffy buttercream frosting, shredded coconut, and embellished with M&Ms - my absolute favourite childhood candy. 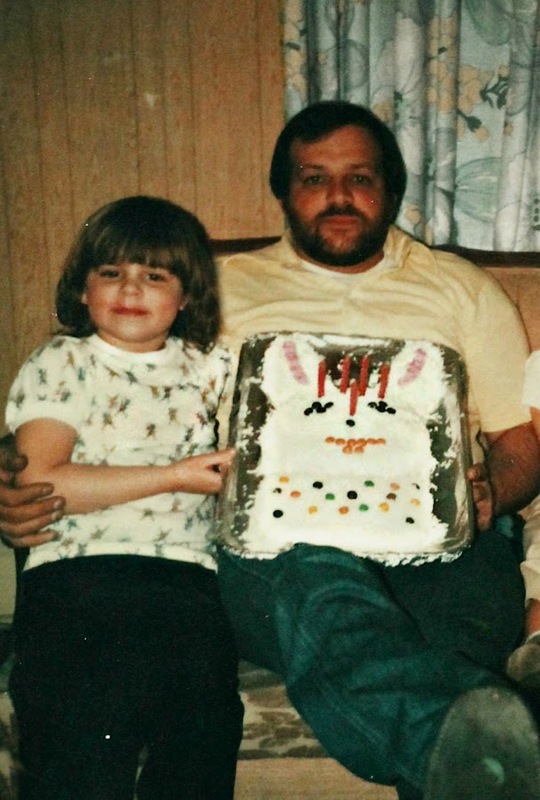 It was the most beautiful cake I had ever seen and I was so proud to pose with it - Dorothy Hamill haircut, Kool-Aid moustache and all. Years later, I was going through my Mom's recipes and found this very cake in a Betty Crocker recipe flyer she picked up at the grocery store. My mother had hundreds of these very recipes stuffed in a binder; they also served as makeshift bookmarks in the countless cookbooks she housed in her bottom kitchen drawer and pantry. One look into her arsenal and it's not hard to see where or from whom I inherited my addiction. As I stared at the professional version of this cake (although Mom's was pretty impressive), I appreciated that she took the time to create something like this, especially knowing it would have been so much easier to purchase one from the local bakery. I quickly realized it was about presentation. And pride. Funny enough, cake decorating and I didn't become friends until several years ago. I made a three layer carrot cake from scratch for a friend's birthday and found I really enjoyed the process. Before this, most of my cake came from a box mix, frosting was a simple buttercream recipe, and it was always a standard 9 x 13 cake. It was fast, it was easy, but most importantly, it was tasty. I eventually got creative and doctored up the mixes, but most attempts ended up with cakes that were overflowing, uneven, and wonky-shaped. I'm embarrassed to say how many cake pops we went through. To say I appreciate cookbooks on the shelves like Tessa Huff's newest creation, Layered, is an understatement. Baking is a science, but building and decorating a sky-high cake with bakery-like quality is a skill. A skill that takes a steady hand as well as oodles and oodles of practice and patience. If you're willing to learn, this cookbook will help you get there, step-by-step. 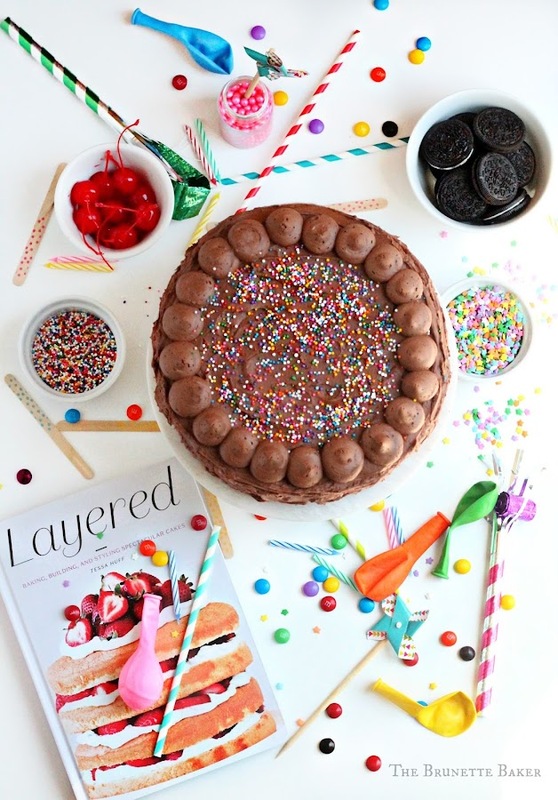 Layered dons a panoply of gorgeous cakes and recipes to choose from - 150 to be exact. Every cake within her book was baked, styled, and photographed by Tessa herself; a true testament to a labour of love. Her instructions are well-articulated throughout the book and guide readers to ensure they have success on the first go. Tips like how to build buttercream dams or using a recipe for a whole other purpose, like pouring leftover whiskey-espresso glaze from her Peanut Porter Cake into a cup of coffee for an adult after-dinner drink. Her stunning, yet delicious photography adds the all important visuals and is truly the cherry on top. Each chapter is broken down into categories like classic, casual, whimsical, holiday, and even adventurous - yeah, I'm looking at you Coconut Mojito Cake. I adore that she adds personal anecdotes within each recipe blurb and allows readers to get to know her. I also appreciate that she offers three different quantities for her swiss buttercream frosting, taking away any guesswork needed to get the job done. She certainly didn't miss any details when writing this book. I chose to make The Birthday Cake because not only are birthday celebrations my favourite, but enjoying a slice of classic yellow cake with chocolate fudge frosting on a random Tuesday afternoon? Yes please. The cake yields a fluffy and moist texture while the frosting lends a fudgy element needed to pair the two up beautifully. It's perfection. As Tessa put is, "If you don't already have a go-to yellow cake recipe, this is it. Memorize it and pass it along. Your future grandchildren will thank you." Oh friends, will they ever! I still have a way to go and a lot to learn when it comes to cake making, but I'm so thankful to have a cookbook like this in my corner to help me along. Whether you're a novice baker or a well seasoned one, you will absolutely love this cookbook and refer back to it time and time again. I promise. I implore you check out my fellow blogger friends all week long as they try their hand at Layered. Want the chance to win a copy of Layered and try your hand at making one of these spectacular cakes? In the comments below, tell me what you're favourite cake is. Giveaway will run from Thursday, May 26, 2016 at 12:01am to end on Thursday, June 2, 2016 at 11:59pm. Winner is chosen at random via Rafflecopter. Winner will be contacted via email and given 48 hours to respond. If not, a new winner will be chosen. Winner selected MUST correctly answer a skill-testing mathematical question. Winner's name will be displayed on Rafflecopter widget. Email address will never be given out to any third party or anyone for that matter. Dislosure: I was given a complimentary copy of this cookbook by the lovely folks over at Abrams. I was not asked to write this review nor am I being compensated for doing so. As anything and everything I review, all opinions and views are completely my own. I will never endorse anything I don't love, use, or believe in and will always give my honest opinion regardless. I love chocolate mousse cake! An old family favorite, that I've seen pop up in a few places. It's a spiced oatmeal cake, with a broiled coconut and walnut topping. It's to die for!! I love anything chocolate! 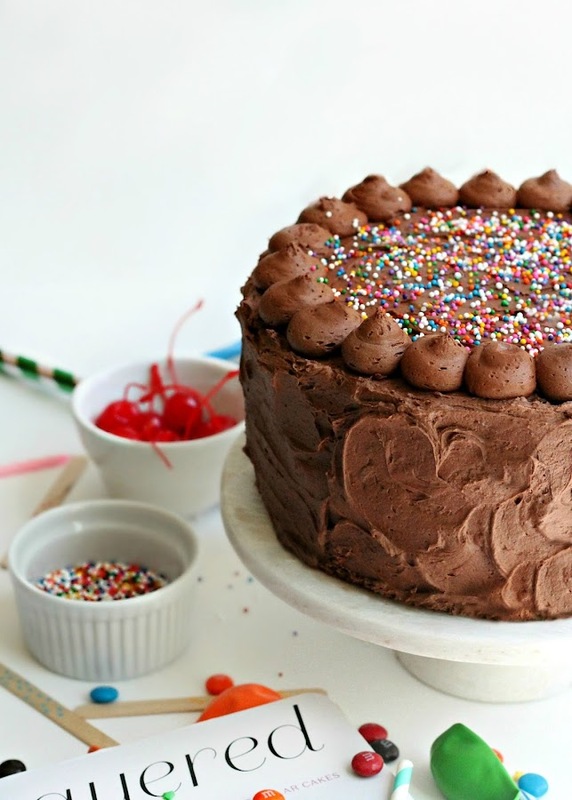 A dark chocolate cake with a dark, fudgy chocolate frosting! That looks like one might fine birthday cake to me. I now lots of people that would request this for sure. I've made that same bunny cake before (for Easter)!! I love all cake...but I think chocolate is my favourite. I love a good vanilla cake or red velvet with cream cheese frosting. Look at you cutie patootie. Carrot cake with cream cheese icing is my favourite. My favorite flavor is definitely chocolate! 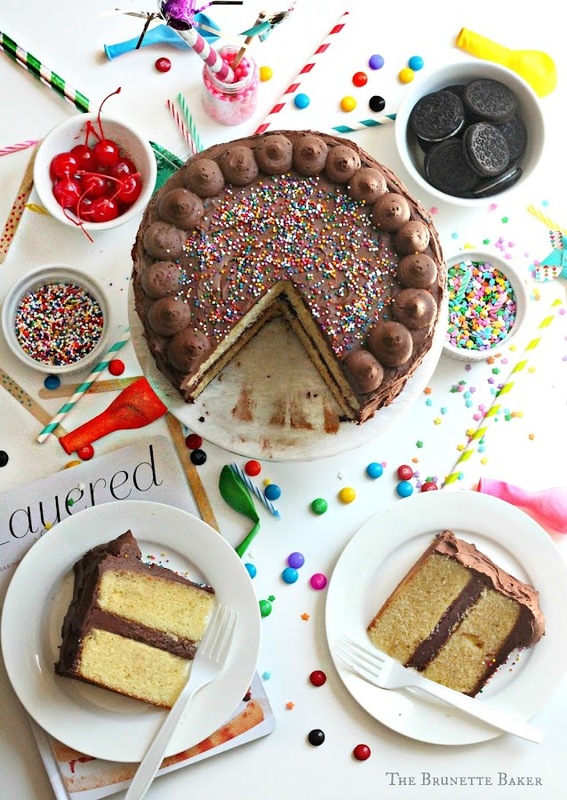 My absolute favorite cake is a 14 layer old fashioned fudge cake! It is very thin layers of yellow cake with homemade cooked fudge frosting! AMAZING!!!! I like most cake, but one of my very favorites is chocolate cake with marshmallow frosting. Yum! I love cake in general, but my favorite has to be either Tiramisu or caramel crunch meringue cake. gosh, how to choose!! I think carrot cake would be my favourite! My favourite cake is Red Velvet with cream cheese icing! Can't wait to have this book n try out the delicious recipes. My fav is red velvet with cream cheese frosting. I’ve always been a huge fan of vanilla cake with creamy, fluffy vanilla icing – yum!! I like any cake I don't have to make. I don't like to limit myself to one flavour but anything with hazelnut and espresso is never disappointing. I think the one you made for this post is my favourite!! If I had to choose, the kind you made here is exactly what I would pick!! Amazing! My favourite cake is carrot cake with lots of walnuts or pecans! I'm also a big fan of vanilla cakes with baked in fruit. I love a good chocolate cake with a chocolate ganache! But I also wouldn't mind a slice of your birthday cake. It looks divine! Old fashion caramel cake or coconut cake with coconut/sour cream icing. My favourite cake is the tuxedo cake! I really like chocolate cake with a mocha whipped cream filling. Hello, one of my favorites is Carrot Cake..
Black Forest cake with lots of cherries. Its a toss up between angel food and cheesecake, depending on my mood. I hardly ever make a cake like this, but your pictures are making me want a slice now! My favorite cake is Red Velvet Cake! But I like ALL cakes, really. Wow. A system that won't let you comment. So yes I too will finally comment that any cake is good, but Chocolate is the best. Favorite? Can't decide ;) but I do like chocolate cake. GIMME ALL DA CAKE!!! Every year, as long as I can remember, my mum makes me a chocolate cake with boiled icing for my birthday. The cake and the icing, by themselves are wicked good, but combined with the years of memories and nostalgia, it's always perfect, and always, the best cake ever. awww I love that cake your mom made you! AND I LOVE THIS CAKE-that frosting looks so luscious, to die for! A dense dark chocolate cake made with good quality cocoa. I love all cake but my favorite would be a good quality Red Velvet with Cream Cheese frosting! That Birthday Cake is gorgeous! My favourite cake is either yellow with chocolate buttercream, or double chocolate with raspberry filling! Chocolate cake, peanut butter frosting, chocolate ganache dripping over the top!